SOMERVILLE, NJ – The Somerset County Board of Chosen Freeholders and the county Planning Board will honor six local projects, including the Cobalt Apartments on Veterans Memorial Drive at the 35th annual Land Development and Planning Awards at 6 p.m. Tuesday, Feb. 20, in the Freeholder Meeting Room, located on the third floor of the county Administration Building at 20 Grove St.
Free parking is available in the adjacent Bernie Field Parking Deck; its entrance is located off of East High Street. Gallagher is the former mayor of Somerville, and was a strong proponent of the development during the planning stages. He also presided at the Sept. 29 ribbon cutting ceremony last year. Cobalt Apartments is the winner in the Residential category of the awards program, which was initiated in 1983; since then, Somerset County has recognized 180 outstanding land developments and innovative planning initiatives. The four-story, 117-unit residential structure in Somerville was located on a former seven-lot parcel that included a junk yard and metal fabrication facility, which had been vacant for over twenty years. The site was severely contaminated and required significant cleanup and remediation before construction could commence. It is located in Somerville’s transit village area, close to the Somerville Train Station and within walking distance of shopping, dining, public amenities and the Peters Brook Greenway. Project amenities include a club-quality fitness gym, outdoor courtyard, club room with recreation dining and entertainment facilities, free Wi-Fi, a smartphone intercom system and an attached parking deck. Large energy-efficient windows provide light to each apartment. The emergency management plan that was developed for the building, in cooperation with Borough officials, includes a generator to heat the building and power an elevator. Electricity is provided to designated locations to provide light, food preparation and computer/smartphone charging stations. A short-term safe haven for residents has been designated in the event of a major weather event. This project demonstrates how a vacant and contaminated property can be transformed into productive use through sound site planning, engineering and cooperation between a developer and a municipality. 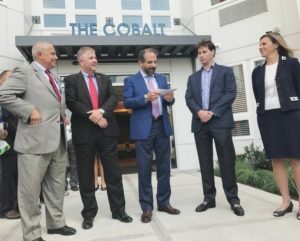 The developer was Cobalt Urban Renewal, LLC. The architect was Minno & Wasko Architects and Planners and the engineer was Van Cleef Engineering Associates. Office category – Mallinckrodt Pharmaceuticals: Located in Bedminster Township, this project addresses the necessity to find a new use for vacant office buildings that were built during the 1970s, 1980s and 1990s. Totaling 230,000 square feet, Mallinckrodt Pharmaceuticals upgraded two office buildings that had been vacant for many years to Class A office space. The company consolidated their Specialty Brands and supporting functions in Bedminster in 2017. The buildings now include a fitness center with locker rooms, a full service cafeteria and a data center. Seventy percent of the office space is now an open floor plan that facilitates a collaborative work environment. Upgrades included energy efficient LED lighting. A new daylight harvesting system was installed which senses daylight to control overall light fixture lumen output relative to the natural ambient light. This system is tied into a master lighting control panel with relays and a programmable timeclock on each floor, which turns the lighting on and off at scheduled times, according to the tenant’s normal business hours. In addition, about seventy-five dead or damaged trees were removed from the property and replaced with 115 indigenous tree species. The developer was Mallinckrodt Pharmaceuticals. The architect was Remiger Design and the engineers were the Rock Brook Consulting Group. Institutional Category – Raritan Valley Community College Workforce Training Center: Located in Branchburg Township, the 47,000 square-foot training center addresses the need for an education and training model to create more effective career pathways into high-demand and high-wage positions. The program, which focuses on technical job training and service learning experiences, helps certificate program students and RVCC graduates with job placement and advancement. Local businesses can benefit from a highly skilled workforce. It provides specialized training labs with real life equipment as well as multi-purpose class rooms. The building, which is consistent with the RVCC Facilities Master Plan, has facilities for cosmetology, advanced manufacturing, environmental controls, welding, automotive and general academic classrooms. It is also home to the Small Business Development Center. The structure maximizes the use of natural daylight to reduce dependence on artificial lighting and has operating windows for natural ventilation. Also, solar screens and sun-shading devices help to control glare and avoid heat buildup. By situating the building where it can share parking space and connect to existing infrastructure, construction required fewer materials, site disturbance and impervious coverage. Sustainable landscaping and the removal of unsuitable soils helped to direct construction to areas that were already disturbed and left virgin soils untouched. The developer of the project was the Raritan Valley Community College. The architect was SSP Architects and the engineers were Van Cleef Engineering Associates. Warren Town Hall: Constructed ahead of schedule and under budget, the new 26,538 square foot Warren Town Hall is located in the municipal complex within the Warren Town Center. The innovative design allows visitors to seamlessly find their way into the building and locate their destination. The offices are a combination of open space and closed spaces as required to serve the need of each department. The corridors are lined with tall pilasters that clearly define each space. Signage, in the form of applied letters, is also placed on each pilaster so that visitors can easily find their destination. The four meeting rooms are named after neighborhoods in the Township. Skylights allow natural light onto the second floor and skylights located in the hallways of the second floor allows light on the first floor. The building was constructed with thermally efficient windows led lighting and the use of NRG block walls with integral insulation which provides an efficient thermal envelope. The developer of the project was the Township of Warren. The architect was Salustro Partnership Architects, and the engineers were Murphy and Hollows Associates. Mixed Use Category – 495 Watchung Avenue: The mixed-use building consists of 2,000 square feet of commercial space and three one-bedroom apartments. The project involved the redevelopment of the old Mansueto’s Fish Market. Taking the unique location of the property into consideration, the site plan made improvements for circulation, allowing proper ingress and egress from the site. Sidewalks were added along the frontage to improve pedestrian circulation. The building, which uses a traditional architectural design with hip and gable roofs, was raised out of the flood zone. All four sides of the building have operating windows for natural ventilation. Radon piping was installed beneath the foundation as a preventative measure for the benefit of occupants. The building is energy efficient, built with green products that are low maintenance and sustainable. High speed internet access, with the latest in wiring for communications, is readily available. The developer was Monogram Building & Design, Corp. The architect was Salustro Partnership Architects and the engineer was Page Engineering Consultants, PC. Excellence in Planning: The Montgomery Township Master Plan Committee undertook an extensive collaborative process with land owners, developers, consultants and staff to create a comprehensive overlay zoning district that will revitalize and redevelop an area of the Township that is currently underutilized. The 50-acre site is located at the northwest corner U.S. Route 206 and Georgetown-Franklin Turnpike. The overlay zone, adopted in October 2017, employed a unique approach to suburban compact design that will allow for an exciting and vibrant mixed-use development with public gathering spaces and community green spaces where residents can live, work and play in an pedestrian-friendly environment. The zone permits 150,000 square feet of non-residential uses and up to 300 residential units which would include housing options for millennials and seniors looking for smaller housing options within walking distance of shopping, jobs and public transportation. The developer’s cost-share includes the construction of two loop roads which will implement the Townships 2003 traffic circulation plan. The overlay zone provides pedestrian and bicycle access to multiple destinations and establishes important missing links from the surrounding neighborhood to existing retail and the New Jersey Transit bus line. The ordinance was prepared by the Montgomery Township Master Plan Committee. ©2019 weiss properties. All rights reserved.